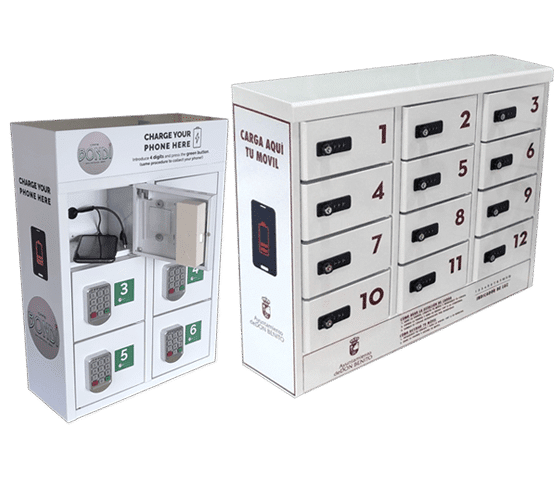 Our mobile charging lockers are ideal for gyms, shopping centers, events, etc. Each is customizable with the customers image in vinyl and have maximum security through our digital or manual PIN code. Each locker has connection for microUSB, iPhone, and type C, so it adapts to more than 95% of the phones on the market. Want to know the prices of the charging lockers? All our mobile charging lockers can be customized. You can send us your own design or we can help you develop one. We can adapt to the solution that most interests you by working on your personalization depending on whether you buy or rent the lockers. These solutions include: custom vinyls, custom paint, external structures of cardboard or other material with elaborate personalization, etc. How to use the charging locker? Open the door, connect and leave your phone. Close door, set code, turn lock counterclockwise ↺ and alter code before leaving. Introduce the code, turn lock clockwise ↻ and open door. Unplug your smartphone and remove it leaving the door open. Close the door, dial a code and press the green button. Introduce code, press the green button and the door will open. How many phones can they charge at the same time? It depends on the charging locker model. They can charge from 6 to 12 mobile phones. Are the charging lockers customizable? Yes, they are totally customizable. You can send your design to info (@) battever.com and, with the purchase of the product, we will send you the customized charging locker. You can also send us a logo and we will create an appropriate design that matches your brand. Can they charge all mobile phones? The device allows you to charge 95% of the phones on the market (microUSB, iPhone, and type C). Which security system is the most recommended? We recommend all digital or numeric code systems since the client is the one who establishes his/her security code. The key system is also effective in controlled facilities where the chances of theft are minimal. Do you rent or only sale charging lockers for events? We also have rental prices. Can customers steal the cables? No. All of our lockers come with anti-theft cables. Do you provide after-sale service? Yes, we change any piece that is damaged (cables, locks, keys, etc.) within 24-48 hours. 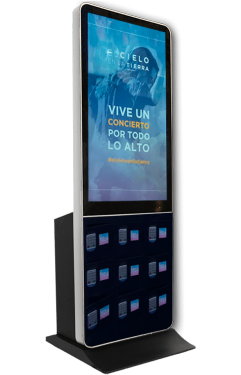 For us it is very important to give helpful, and always available service for the users of our mobile charging lockers. Simple. It is very similar to hanging a picture. You only need to make two holes to install hooks that we provide, then hang the lockers on the hooks. Design: MCrespo · Legal warning · Cookies · 2018 © Battever "Your battery on the go"